Emmitsburg, Md. – Visit Frederick proudly announces that The American Bus Association (ABA) has named 40 Years a Saint – 40th Anniversary of Elizabeth Seton’s Canonization to its annual Top 100 Events in North America for 2016. Inclusion in the Top 100 list, published as a supplement to the September/October issue of ABA’s Destinations magazine, indicates that the exhibit offers excellent value to both tour groups and individual travelers from around the world, according to ABA. September 14, 2015, marks the 40th anniversary of the canonization of Elizabeth Ann Seton, the first American-born saint. 40 Years a Saint is a special exhibit at the National Shrine of Saint Elizabeth Ann Seton, telling the story of her journey to sainthood. It highlights the ceremony in St. Peter’s Square where she was proclaimed a saint by Pope Paul VI. The centerpiece of the exhibit is the actual banner which hung in St. Peter’s Square on the day of her canonization. The exhibit opened in advance of this weekend’s 40th anniversary celebration, September 12-14, 2015, and it will remain throughout the anniversary year that follows. Elizabeth Ann Seton began what became the foundation of the Sisters of Charity, in Emmitsburg, Md., in 1809. It was the first congregation of religious sisters to be founded in the United States, and its school was the first free Catholic school in America. This modest beginning marked the start of the Catholic Parochial school system in the United States. In 1810 the institution became a religious order. A group of buildings was constructed including a residence for the Sisters, a novitiate, a boarding school for young girls, a school for poor children, and an orphan asylum. The remainder of Elizabeth Ann Seton’s life was spent leading and developing the Sisters of Charity. With the release of the American Bus Association’s 2016 Top 100 Events in North America, ABA celebrates 34 years of the program. What began as a way for motorcoach operators to incorporate new product into their itineraries has grown to one of the most sought-after lists by travel professionals, motorcoach operators and the general public. The ABA Top 100 Events list is available online at www.buses.org/Top100. 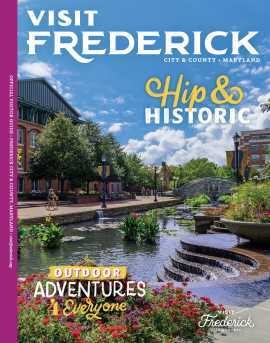 Visit Frederick, also known as the Tourism Council of Frederick County (TCFC), is the recognized Destination Marketing Organization for Frederick City and Frederick County, Maryland. It operates the Frederick Visitor Center and related programs that include Destination Marketing and Group Tour Marketing. For more information about membership and events, go to www.visitfrederick.org.